So are you ready for my usual ramblings again? Sorry but I can't give you that yet. We are still out of the country! You will know once we are back! :D Enjoy today's card! Just a quick card to keep you all entertained while we are in the Dominican Republic! Sorry for the lack of details. I just figured you would want some pretties to look at while I was gone! Haha! And I mean it! Your sweet words have meant so much to me. It has been one long week and we are finally starting to feel like our lives are back to normal...if you can call it that! I apologize for being gone so long! I can't believe it has been over a week since I have posted anything! For those of you who are interested, the trip to Iowa and the funeral went well but we have received some more horrible news since. While we were there, Nick's aunt (who has been suffering from breast cancer) started having trouble breaking so they took her to the ER. They did some tests and found out that the cancer has taken over her bones, lungs, and stomach. She has 2 kids and a loving husband. I know that this is a really tough time for them so if you could say a little prayer or two for their family, I know they would appreciate it. Also, Nick's grandpa (the husband to his grandma who died) was having pains in his side and so the family decided to take him in to the hospital as well. After lots of testing and CAT scans they discovered that he too has cancer and it has spread throughout his body. He has it all over and does not want to receive treatment due to the fact that he knows he has Alzheimers and he misses his wife dearly. We know that he will be in pain as he waits out this long process but this is what he wants. If you could say a prayer for him as well, I know it would help. What this family needs the most right now is God's comfort and love. They are all hurting so much and I just hate seeing them struggle, my husband especially. Anyway, this is a card I made forever ago but I wanted to share it with you. I used one of Jen del Muro's old Sketch For You To Try challenges. I also pulled out the adorable "Whatever Floats Your Boat" set from Gina K. I stamped the turtle, colored him in with my SU! markers, cut him out, and added some crystal effects for added dimension. I then popped him up on an oval cut with my nesties. I popped the entire oval up over the rest of the card and added my sentiment! Well, again, I am not sure how often I will be able to post this next week because we are headed to the Dominican Republic on a missions trip. We are excited, yet very stressed about it. We are already feeling very behind and this trip is definitely not helping us much! :) I will try to schedule some posts but I am not sure how much I will be able to get finished! Either way, I hope you have a great week and I will post again when I get back! Good evening everyone. I just want you all to know that I will probably be MIA the rest of the week. Nick received a phone call this morning saying that his grandma had died suddenly. She did not have any huge health problems at all, her heart just stopped working properly. Anyway, we are headed home to Iowa for the funeral tomorrow and if you could just say a prayer for Nick and his family that would be great. He is taking it really hard and I know his mom is struggling with it a lot as well. His grandma was an amazing woman. She bore 17 children (only 2 of which were twins) and has been taking care of her husband who is battling Alzheimers. Anyway, I made this card over the weekend not realizing how soon I would need it. This card will be going to Nick's mom. 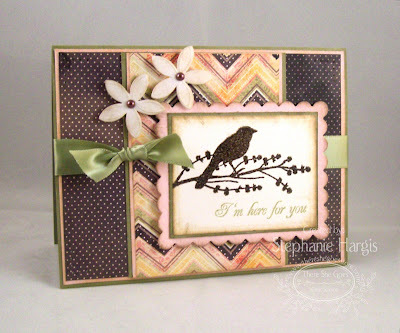 As far as details on the card, I made it for this week's featured stamper on SCS. This week was Judy aka StampingQueenJar. She is fabulously talented! I choose to case this card of hers. For my version I used my "Here For You" set from There She Goes along with my BasicGrey Porcelein paper. I embossed the bird and cut him out with my nestabilities. I added some ribbon behind the main panel and popped up some pretty little flowers. The whole card was also given a distressed look with my Tim Holtz distress inks and sponge daubers. My last and final touch was to paper pierce around the corners of the card. Well, I hope that you like this card. Again, I apologize if I am not able to post much this week. We will see how things turn out. Take care and enjoy your evening! Here is my first card. I kept it REALLY simple. I used Julee's Mojo Monday sketch challenge for the layout. I pulled out my Parisian Breeze Specialty designer paper and accented it with some Basic Gray card stock. I then used another strip of Baja Breeze layered on Basic Gray for the vertical strip. Over that I tied a piece of white taffeta ribbon with a bow. The front panel was then made of a piece of Whisper White card stock layered on a piece of Basic Gray card stock. I stamped the phrase "To Thine Own Self Be Kind" (which I am still trying to understand the meaning of) in the lower right corner. Obvious enough right? Ok...now here is the difference between the two. On my first card I just stamped my leaves from the Central Park set directly onto the main panel and called it good. It's simple and cute. Ok...here is the second card. Do you see the difference (click on the picture to make it larger if need be)? I stamped the leaves on the front panel again only this time I stamped them a second time and popped the second leave up on dimensionals so that it gave the card some added depth. I also paper pierced the corners for a little more detail. 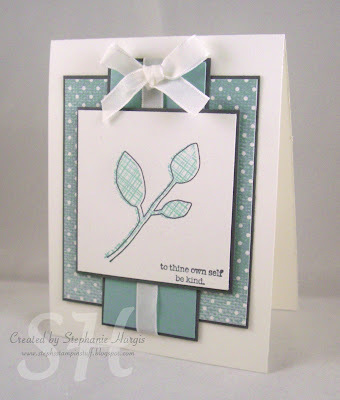 For this card I used the Verve March Release sketch challenge! I had to alter it a little bit so that I could use my ribbon (we all know how hard it is for me to make a card without it) but I think it still works. I just moved my second little embellishment down some. Anyway, I did this sketch in under 30 minutes because I was on my way out the door but I really do like how it turned out. 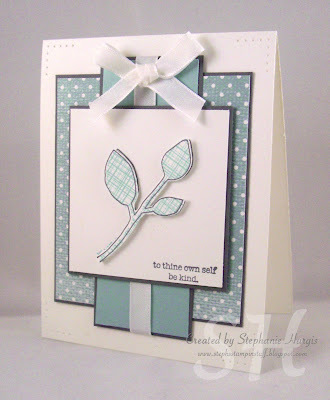 I pulled my Verve Plain Jane stamp called Psalm 31:24 and paired it with my BasicGray Porcelain paper. I gave the edges of my card stock a distressed look by running my fingernail down the sides of them and then rubbing my sponge dauber over them with Tim Holtz Antique Linen distress ink. I scalloped the bottom edge of my dp with my Martha Stewart Lace punch too. The verse was stamped in Ruby Red ink and covered with my Sakura glittery roll pen. I felt like this gave the ink a more muted look, which it needed. I then popped the verse up on dimensionals and added some ribbon and a little flower that I had colored with my Ruby Red SU! marker. Well, I think that about sums up this card. I hope you are all having an enjoyable Sunday afternoon! Did anyone forget to set their clocks ahead last night? We almost did but thankfully I just happened to see that my computer clock had jumped forward an hour! Phew! :) Well, make sure you stop by later tonight for my second card of the day! Also, tonight is the Verve release and I am SO excited about it! I will be at the party! I downloaded a free 30 day trial of Photoshop Elements and have been playing around with it a lot! :D In fact, I spent so much time with it yesterday, I only got 2 cards made! Haha! So do you like the new look? I have seen some other women using this digi kit but decided it was too cute not to use! I started out by making my blog header and then decided to make some sidebar headers as well. I really like how they turned out! Oh...check out my picture too! I figured out how to make a watermark! It's simple but I think it looks neat. Anyway, today's card was an easy one but I am not that happy with how it turned out. I used Jen's Sketch For You To Try from last week and Krisitina's Color Challenge on it. I pulled out my Stitched Exotics stamp set and paired it with my Candy Lane dsp. I used some chocolate cordoroy brads and wide ribbon as well. The sentment is a rub on from the Chit Chat pack. Happy Friday! :D Have I ever mentioned that I LOVE Fridays? Oh yeah...I have...like a hundred times! Haha! My hubby is off snowboarding so I woke up SUPER EARLY so that I could make his lunch and help him get ready to go. He won't be getting home until pretty late which means I have lots of time to clean and stamp! Yippee! Ok...not yippee that he is gone but yippee that I can get some stuff done. 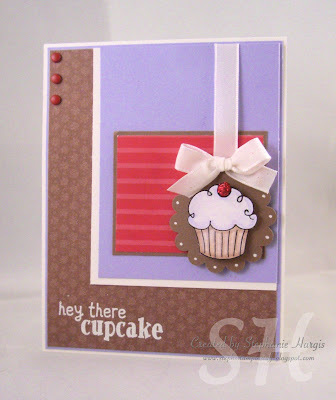 Anyway, it's Cupcake Friday and I am super excited about today's card! This week's sketch actually looked REALLY tricky. If you don't believe me, go check it out for yourself! Hehe! Anyway, once I sat down and started thinking about what I wanted to do I found that it came together really easily. When I showed the sketch to Nick he said "It looks like a window." Lightbulb moment (Thank you Nick!)! :D I pulled my Upsy Daisy set and created a window look! I just love the look that a split image can bring to a card so that is what I decided to do. To get the look I wanted I stamped the image and heat embossed it with Irridescent Ice embossing powder. I wanted it to stand out so I made it glittery...mmmm...glitter! Hehe! I then cut it to the size I wanted and then split the image into a 3x3 array (that would be one of our 2nd grade math terms)! :) After putting the image back together like a puzzle I then proceeded to glue the little squares down onto a piece of Chocolate Chip card stock. I wanted a little more detail in the upper right hand corner so I punched a butterfly with my Martha Stewart punch, added some rhinestones to the middle of it's body, and glued it down. As for the rest of my card, the base of my card is Very Vanilla, Chocolate Chip, and the fabulous To the Nines Specialty dsp. I was originally going to include my sentiment on the bottom of the card but it ended up being much too big and I couldn't get the look I wanted so I left it off. Instead I added some of my favorite Chocolate Chip ribbon and called it good! There is a sentiment on the inside that says "you're on my mind" so I can't exactly call it a "blank inside" card (hehe...just a little Brian Regan joke for ya...if you don't know what I am talking about just ask)! Well, that's it for this card! I hope you enjoyed it. Now, before you scamper off, make sure you check out Taylor's blog as well as this week's Featured Sampler. This week Taylor choose Broni Holcombe! Oh my word...let me just say that she is one fantastically talented stamper! You will not want to miss her blog! Wait! Don't leave yet! I have one more thing to mention and it is IMPORTANT! Taylor is celebrating the First Birthday of the Taylored Expressions Store and she wants to invite you to the party! The festivities will last all weekend long with games and prizes on her blog! There will be drawings for Party Favor Packages for three days - Friday, Saturday and Sunday, with a different package given away each day. PLUS on Monday there will be a Sweepstakes Grand Prize winner drawn from all the orders placed at the Taylored Expressions Store from Thursday through Sunday. In order to enter today's drawing all you have to do is participate in the TECC sketch by Sunday night! I am ashamed to admit that I haven't shown this card to you yet! I made it almost two weeks ago for the VSN challenge to create a clear card and the Viva la Verve sketch challenge with a twist of acetate! Anyway, I honestly don't know why I have waited so long to show you it because it is one of my very favorite cards I think part of my problem is that I have already sent it to someone and it wasn't sitting on my desk waiting to be posted. Often times I forget about a card when they aren't in front of me! Well this card is one that I spent a lot of time on. I wanted it to turn out beautifully so I worked extra hard on it. The card base that I used is actually just a transparency that you can pick up at any office supply store. I cut it down to size and then folded it in half, making sure it was creased well. I then attached my layered pieces of card stock to the front and inside. 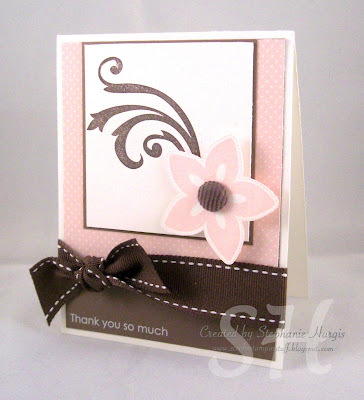 The dp I used is actually from my BasicGrey Bittersweet collection and the card stock is Pink Pirouette, Whisper White, and some chocolate card stock from Bazill. 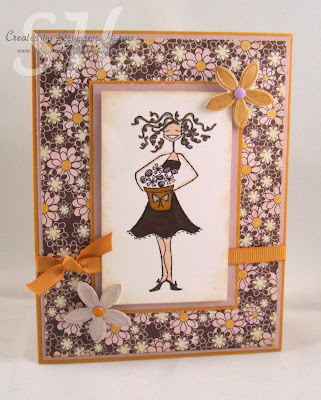 I used two of my very favorite Verve sets called Meditations (the flowers) and Serenity (the sentiment) on this card. I embossed the flowers and cut them out before popping them up on dimensionals. Behind that I tied a piece of chocolate ribbon that I picked up at Wal-Mart for really cheap! I also added the sentiment after stamping it and punching it out with my word window punch. My final step was to glue on the 6 dew pink dew drops. I think they create such a cute look! As soon as Nick saw this card he said "I wish you would have made this card BEFORE my birthday!" Haha! I can't remember if I told you this or not but my husband has a slight obsession with moose! He is so cute. If he sees anything with a moose on it he will say to me "Don't you think this would look good in our house?" Ok...enough of my rambling. For this card I used Mr. Riley the Moose from Hanna Stamps. I just love this image. In fact, I think he may be my favorite! I colored him in with my Prismacolor Pencils and Crayola Crayons using my blending stump and OMS. After I was finished coloring him I then stamped Happy Birthday underneath him. The sentiment is from my Stampendous Totally Tabs stamp set that I got from Taylor almost a year ago! 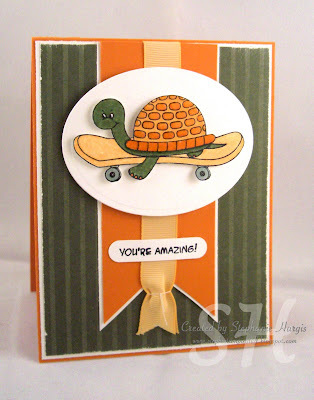 :D The paper that I used on this card is from the BasicGrey Archaic paper pack. I sponged the edges down with Tim Holtz Walnut Stain and Antique Linen distress ink. I then added brads to the sides of the card and wrapped around some felt ribbon that I picked up at Archivers! Well I hope you are enjoying your Wednesday evening! Only one more day of school is left this week and I am SO happy about that! :) It will be wonderful having the weekend free! So as most of you know, Nick and I share the office. I use it as my stamp room and he uses it as...well...the office! Haha! If you remember back to this post, my area started simple and small. Over the past year it has really started to grow because my amount of stuff grew and I kept running out of storage space. Anyway, one day Nick brought me home this fabulous cabinet that someone was just going to throw away. Well of course he thought of me so he set it up in the only space we had available (between the closet doors) and installed some organizational items inside of it. So, today I wanted to share some pictures of what my room looks like and how I try to organize. Before I begin, you will see some random artwork all over the room. This is all Nick's art (he is very talented) and I told him he could display it in here! He has an entire wall of art (above my desk)! I hope you enjoy! Here is a picture of the cabinet all closed up. It fits perfectly in between our closet doors. On top of the cabinet I have 6 jars (from Hobby Lobby) full of ribbon, flowers, buttons, and ribbon scraps. Each jar is labeled as most things in my room are. I bought a label maker from Wal-Mart and have used it MANY times! The ribbon in the jars are wrapped around the old fashioned clothes pins. I found the clothespins at Hobby Lobby. Behind the jars is a little drawer organizer that Nick found at our local Ace. I have organized the drawers by SU! color family and each drawer is labeled with it's own color. Inside each drawer I have my reinkers, sponge daubers, and wheel ink cartridges. This organization system has proved to be very beneficial because I am no longer digging around trying to figure out where each sponge dauber or reinker is. Here is a picture of the cabinet opened. As you can see, when it is opened it takes up a lot of space! :) There is so much room inside of it and Nick has done a lot of work to it. I store almost everything inside of here so you can see why I love it so much. This is the middle of my cabinet. Shelf 1: On the top shelf I have my Sterilite drawers holding my current and retired SU! designer paper as well as my 12x12 card stock. Next to those drawers I have my card basket and stamp box (which can be found over at There She Goes). Shelf 2: On the second shelf I have another set of drawers which hold my non-SU! designer paper, my designer paper scraps, and my embellishment packs. Next to that set of drawers I have a basket that holds my Bind-it-All, Crop-a-dile, and label maker. Shelf 3: The next shelf has a third set of drawers that hold my coloring tools (pastels, watercolor crayons, Shimmerz, Stickles, paintbrushes, etc. ), other tools (hand punches, extra scissors, brayer, paper crimper, etc. ), and my different types of adhesives. Next to those drawers is another basket that holds all of my alterables. Shelf 4: The bottom shelf has all of my embossing powders, glitters, etc. I keep all of these in individual containers and inside each container is a spoon. I have found this to be an effective method because it is much cleaner and powder less is wasted. This shelf also holds my card boxes (which are stuffed). This picture is of the left door. I store my nestabilities on magnetic strips so that I can easily find them and grab them. Underneat that I have a little spot for notes I might have. At the very bottom is a little rack that I picked up at Ace. I use it as a sort of makeshift Clip-It-Up. I used snap rings and binder clips to hold my 6x6 packs of designer paper, rub ons, and stickers. Here is a close up shot of my makeshift Clip-it-Up. Here is the right cabinet door. On this door Nick installed a bunch of short towel rods (from Ace) that hold MOST of my punches. The punches I keep here are the ones I use most often. The others are in my tool drawer. Underneath the towel rods he also installed some j hooks and dowels to hold my spools of ribbon. As you can see, I am going to need to upgrade this area because it is very full and I have no more room! :) Below that he attached some baskets (from Wal-Mart) that hold my little embellishment containers (most of which are from SU! ), SU! wheels and handles, and extra clips and clothespins. Here is another wall in my room which has my "desk", as I call it. My desk is the same card table that I have had since the beginning. On top of my desk is my fabulous Making Memories Carousel which holds the tools I use the most as well as my dimensionals. Above my desk is my covered bulletin board which is where I keep track of my sketch challenges (yes I know I am obsessed). Above that bulletin board is my dry erase calendar. To the left of my desk is a tall Sterilite drawer set which holds my Big Shot materials, sewing materials, and anything extra I might need to store. In front of it is my pink file box where I store all of my card stock scraps and my Big Shot. On top of the drawers you can find my SU! markers, colored penciles, and a cute little spice rack that I picked up at Ross for super cheap. The little spice containers hold different brads, eyelets, and dew drops. To the right of my desk is a dvd tower that holds my SU! sets and other wood mounted stamps. Next to that is a file cabinet that has all of my card stock and SU! demo supplies. On top of the file cabinet is a spinning cd rack that holds most of my unmounted stamps. Above that is my SU! ink caddy. Here are a couple more pictures of my file cabinet area. On this wall is a couch (where Nick sits when he is on his laptop), an UGLY table (which is why it is covered in fabric) that has my sewing machine on it, and another dvd tower that holds a couple of random jars and embellishments as well as my JustRite sets. Here is a closer view of the tower. In front of the tower is a basket that holds all of my old catalogs and magazines. Ignore the falling rack behind the couch. It is for future decorating! Finally I wanted to show you the fourth wall which has our computer desk as well as another filing cabinet (which actually holds important documents) and other office supplies. This is where I do all of my posting and that is why I display my cards here. It reminds me of which cards I have not posted yet! Well, I hope you enjoyed the tour of my little room. Sorry it isn't much to look at! Nick is still working on my pretty desk so things will hopefully change in the near future. I already have plans for when we build our new house too. I am excited about being able to add color to the walls! Ok, so I must admit that I absolutely love how this card turned out! :) It is so bright and cheery! I actually don't even know why I put this color combination together, it just sort of happened! Haha! 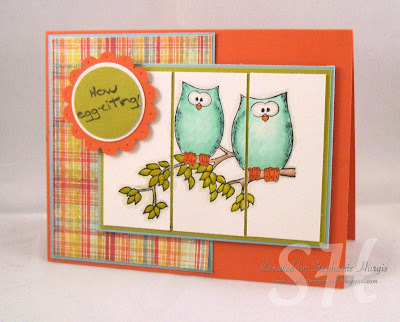 Anyway, I used my very favorite Gina K stamp set called "Owl Always Love You" and colored in the image with my SU! Markers! Once I was finished coloring I added some stickles to the eggs and the flower centers too! I have been on kind of a bling kick lately! Have you noticed? :) The sketch that I used is one that Kurtis challenged the StampTV group with last week Thursday. I love Kurtis' cards because they are always so simple and beautiful. I wanted to keep that look with my card so I left off the dp. Can you believe it??? I know! Me neither! Haha! Anyway, I did add some ribbon for an added touch as well as some yummy crystals from Zva Creative! If you are curious to know what my card stock colors are I will tell you. They are Regal Rose, Tempting Turqouise, and Old Olive. Well, I really hope you enjoyed today's card! I am enjoying my evening at home with my husband. I plan on getting some cards made while he works on other things so I am excited! Take care! Satan is hitting me below the belt today and I am doing all I can to stay encouraged. I hate how he does this to me. I have such a wonderful weekend full of so many blessings and he just starts tearing me down little by little. If you could say a little prayer for me I would greatly appreciate it. I have been doing everything in my power to stay busy so that I can get my mind off of my discouragements. Anyway, I wish I had a card with scripture on it to share but I don't so I will have to create one later this evening. Until then I do want to share this card with you. I made it a while ago for VSN and Mercy's sketch challenge and I just love how it turned out! I used my much neglected Crazy For Cupcakes stamp set and my Sweet Slumber Specialty dsp. I also used my new So Saffron ribbon that you can get free through Sale-a-bration! The image was watercolored with my blender pen and reinkers. I then added some crystal effects to the sprinkles and flame. I hope you all enjoy your evening. I have Bible study tonight so I should be able to get my heart back on track (I hope)! Thanks for all of your wonderful support! I love this verse! I know I say that about a lot of verses but I seriously mean it! :D Anyway, I made this card for the Mojo Monday sketch challenge. I know, it's almost late but the point is that it isn't! Hehe! This card was actually really fun to put together. The stamp I used is one of my many Verve Plain Jane sets called Isaiah 61:3. I stamped it with Tim Holtz Walnut Stain Distress Ink and then embossed it. I also used the gorgeous BasicGrey Bittersweet dp and paired it with some Kaiser Craft pearls. I also used some yummy ribbon that I picked up at Hobby Lobby. For the following touch I added some felt flowers to the corner of the front panel. Thanks for stopping by again today! I hope you all had a fantastic day! Nick's sermon was wonderful. It was very deep and rich with the Holy Spirit. I could just feel His presence this morning. It was truly amazing. I can tell you that I honestly really needed that. Last night we went over to our good friends house and we had such wonderful discussions about our struggles and how the Lord is working in us. I just can't even begin to tell you how much I have been blessed this week. Anyway, I just wanted to share that with you. I also want to share this video with you. It's incredible and you will be moved! I lift my eyes up to the hills- where does my help come from? My help comes from the Lord, the Maker of heaven and earth. He will not let your foot slip- he who watches over you will not slumber. Well, that's it for today! I will be back tomorrow with another card! See you then! I received the sweetest award this weekend and I wanted to share it with you! Crystal gave me this award and I couldn't have been more touched by it. Sometimes I wonder if sharing my heart is always worth it but then I have wonderful women like Crystal let me know that it is sometimes valued and I take pride in that! :) Thank you so much Crystal for this amazing award, you really made me feel special! Anyway, I am supposed to share this award with 5 other women and I know just who those women are! I know so many women with wonderful hearts but I am drawn to those who are not afraid to share their faith on their blog! Now, to be honest, I hate feeling like I am going to leave someone out so if I do, I greatly apologize. It's not my intention, I promise! Leanne: She's an amazing friend and such an encouragement to me as a Christian woman! Dawn: Have you seen her Sunday shares??? They are full of blessings! Patter: Oh my goodness! She is truly amazing. Her faith is obvious. All you have to do is glance at her blog to know her heart! Laurie: She's phenomenal. She has been through such trials and her faith continues to shine through! Do you mind if I keep going? Ok...I will! Christi T: A dear friend with such an uplifting personality! Becca: Not only is she fantastically talented but she has a heart of gold! Christi M: I just found her through a Colorado Stampers group and am delighted to discover that she loves Christ! Jill: What can I say? She's amazing! Sita: Her faith is shown in almost all of her creations! Betty: I just recently started following her blog and have been blessed tremendously! 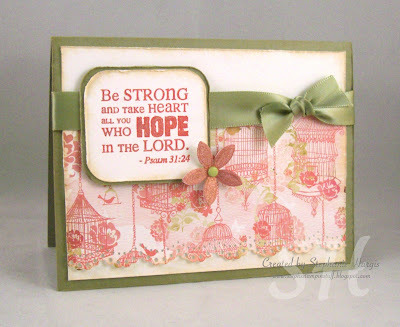 Amy S: I have been following her blog since I first started stamping because I was so touched by her faith in God! Mercy: Can you say "Total Sweetheart???" I just love her heart! Ok...so the more I think about it...the more I realize that I am blessed so much by this hobby! You ladies don't know how much you mean to me! I could go on and on! In fact, I will keep adding to this list as I stumble across more faith based blogs! If you have a blog that you would like to share with me, I would really love it! Again, I don't want to leave anyone out. That is actually one of my worst fears because I personally know how it feels! Take care and thanks for allowing me to share more of my heart with you! Good morning everyone! I hope you are all having a fantastic day so far! It is absolutely gorgeous here! It is currently 70!!! Can you believe it??? It's March 1st! Haha! Anyway, Nick and I plan on playing some tennis later this afternoon and we are looking forward to it! He is also looking forward to getting this sermon over with! :D He loves to preach but it is definitely stressful for him! Today's card is long overdue! I made it last week for the VSN as well as Amy R.'s Friday Sketch Challenge. I used my Gina K set called "Whatever Floats Your Boat". It was the first chance I had to ink it up and I was just thrilled with the final creation! I colored the turtle and skateboard with my reinkers and blender pens. I then covered the turtle with crystal effects. The paper is the retired Hawaii Papaya dsp. Well, that's it for this card. I will be back later with another card! Have a great day!